Mook Review: The Giver | mookology. November 20, 2014 / Mookology. Reading was always something I loved as a kid. When most of my peers would go home and spend hours in front of the television, I was the nerd who couldn’t wait to finish another chapter of my book. I read everything and anything, both inside and outside of school, so it is no surprise that I read The Giver when it was part of my elementary school curriculum. However, the distinct difference between The Giver and all the other books I had read up to that point, it was one of the first books that actually made me feel something. Furthermore, it made me WANT to feel something. Even at a young age, I understood after the impact of The Giver. The novel isn’t easily forgettable, and shows us why it is so important to feel, to live, to explore. When I picked it up again as a refresher for the movie, I was astonished at how advanced the message really was. In a world where we can barely keep up with technological advances, a world where microchipped DNA doesn’t seem too unrealistic, The Giver really hit home. I was reminded of why I fell in love with the story in the first place, and also why it is a Newbery Medal winning novel. Lowry did a magnificent job of making the futuristic dystopia both relatable and timeless, even in todays very advanced society. I would hope that adolescents today still have the same response to reading The Giver as I did, and want to cherish the present and the ability to feel and live freely. In many ways, The Giver is more impactful now than it ever was before. Every new generation becomes more and more detached from the real world, instead hiding behind smartphones, tablets, and laptops. I would definitely suggest reading The Giver if you haven’t already, but also if you have. It is so short that you can breeze through it, but there will also be moments that you didn’t realize or understand before. Since the story of Jonas and The Giver is timeless it does not disappoint, and will make you take a deep breath in light of the present. I have a theory about why “The Giver” was so poorly received by viewers and critics… and I think I am right. When put up against box office hits like “The Hunger Games” or even “Divergent” there is something about “The Giver” that just falls flat. Even though it was packed with well known actors such as Jeff Bridges, Meryl Streep, and Katie Holmes, it is almost boring compared to the YA dystopian epics in theaters now. The other YA blockbusters are action packed, with jarring plot twists, and blurring divisions of good and evil. However, none of those other blockbuster mooks live on middle-school curriculums or won a Newbery Medal. That’s what made “The Giver” what it is. When I saw the first trailer of “The Giver” I knew it was going to try and be something that it wasn’t. 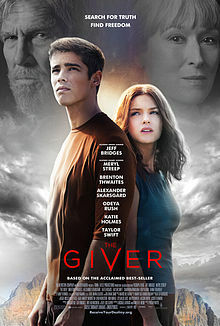 Although it didn’t push the limits as far as I had expected, “The Giver” still tried to keep up with the ranks of it’s competitors when it shouldn’t have. There were some obvious changes to the book, most noticeably the much more prominent roles of Fiona and the Chief Elder. That I did not mind so much, since the novel really only focuses on Jonas and it was necessary for the film to give a more 360 degree view of the story. For the most part I did actually enjoy the movie, but as a whole the film just didn’t seem necessary. Why bring a literary classic to life only to make money off of a trend? “The Giver” could have been simpler, and more honest. To summarize, if YA dystopia hadn’t become so popular as of late, I do not believe they would have made this movie. In my opinion, “The Giver” was created purely to keep up with demand. The Giver was never part of our curriculum and I read it when I was in university. Once I was done reading, I kept thinking how this profoundly beautiful book was YA. I completely agree that it was a movie that made you feel something, a completely unforgettable read. To this day, I push this book to people who haven’t read it. As to the movie, I think you’re thoughts on it are spot on. It wasn’t necessary and it didn’t need to sit side by side the other dystopian films. Maybe like the Lord of the Rings, it would have been better if they waited longer before making this movie. Reblogged this on Thoughts That Come Unguarded. I haven’t seen the movie yet, but I guessed the same thing. And I was really scared what they would do to a novel that left me crying and breathless on my first read. It’s like Hollywood messing with your first kiss or your best friend in high school or something of equal importance. I will still see the movie , but The Giver is something sacred and I’m not sure they should have gone there. Though some scenes were rather well done the movie lost some of the message that the book conved beautifully.